How about dew drops on whiskers? 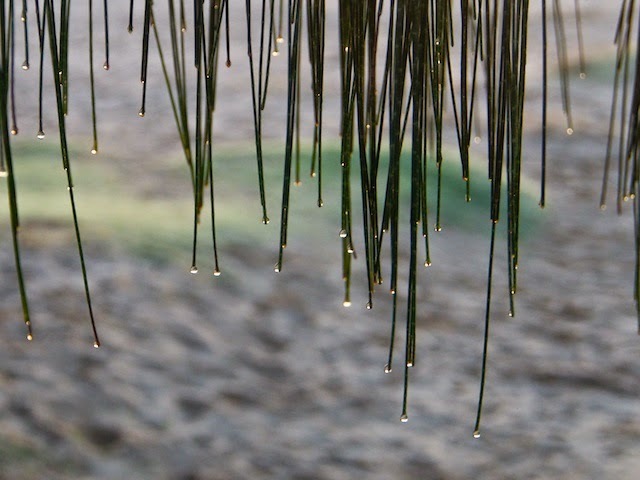 I love the way the dew just hangs on the ends of the casuarina bracts (are they bracts or leaves?) early in the morning. I thought there was going to be a kitten there too! "Needles"? There is a reference to "needles" in wikipedia. Midge, the green bits on Casuarinas are the stems. The leaves are tiny almost microscopic, scales. You can see them with a loup or feel them by running the stem around in your fingers and feeling tiny bumps. Flowers both male and female (separate flowers) are reddish brown and quite tiny too. I see Elaine has already told you. They are little branches with tiny tiny leaves. I love casuarinas and the noise of wind in their "leaves". They probably remind you of the sea. They remind me of inland streams though we also see them in the native forests around here. A very adaptable plant it seems. I also saw a lot of them in Bermuda. They planted them when their own native cedar was decimated by some bug. They call it Australian whistling pine. But it actually isn't a pine.